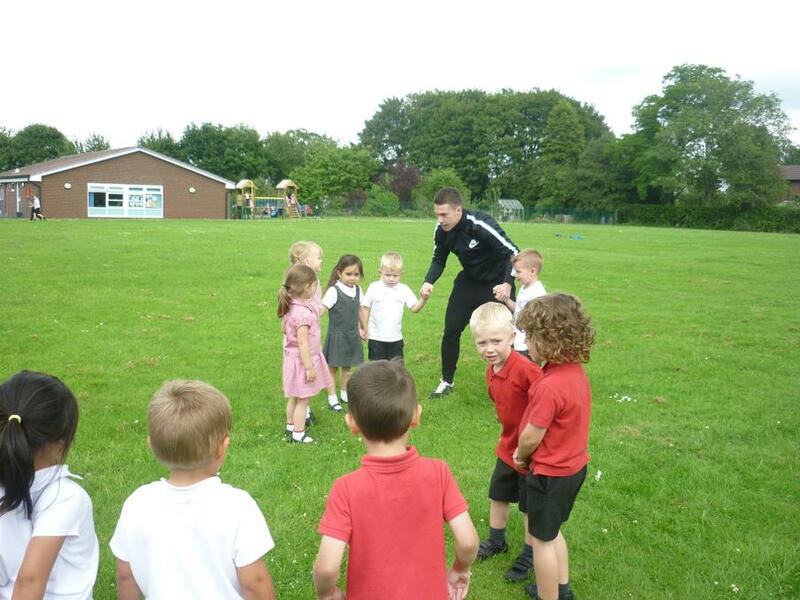 Jesse's daddy came into nursery to do some football training with us. 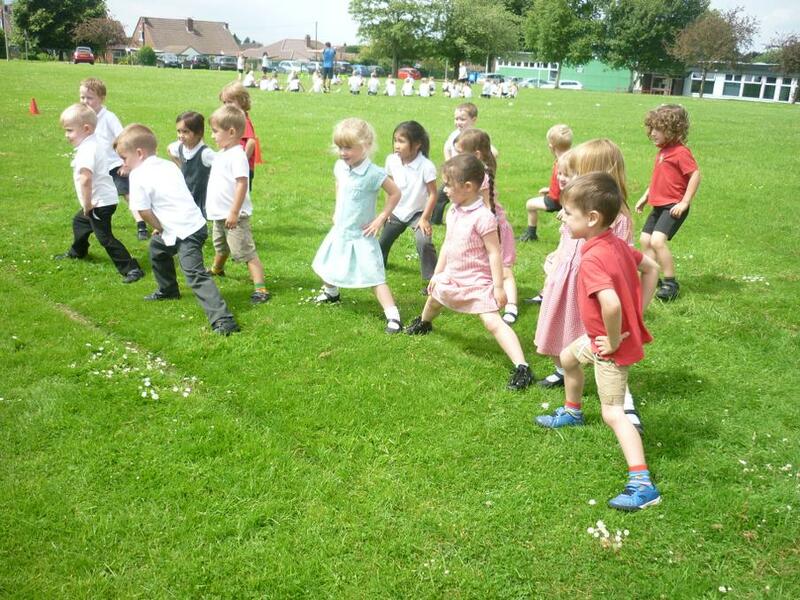 We did some stretches to get our muscles ready and then we played a game of chase to warm up. 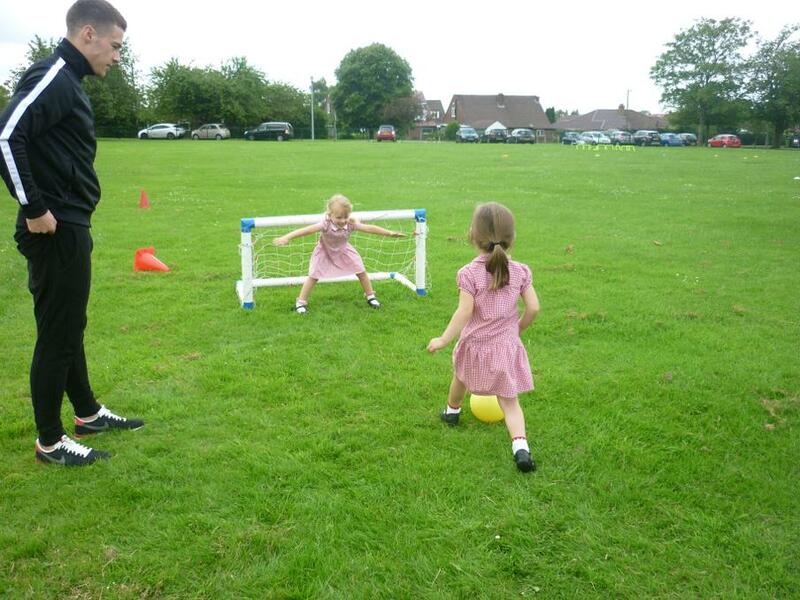 We then took some penalty kicks and had a game of football. 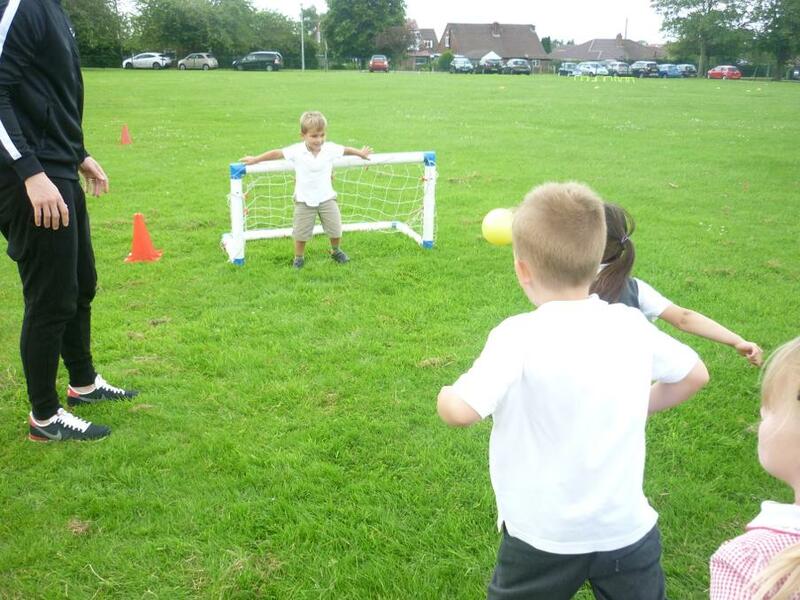 There were some good saves made by the goalkeepers and also goals were scored along with great celebrations! 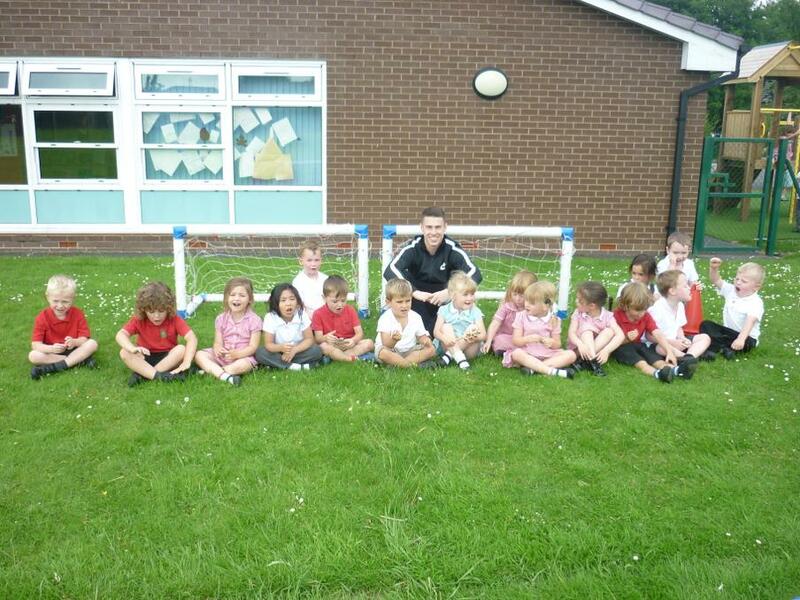 Good luck Mr Rowe at your new club and thank you for coming in, we had a great time. We had a great day at Stockley Farm with Reception Class. Richard showed us around the farm for the day and told us lots of interesting information about the animals and we had a good sing along on the tractor ride! He was very impressed with the things that the children already knew about animals and the questions they answered. We met lots of different farm animals including some that were only a few days old, bottle fed the baby goats, stroked some smaller animals in Pet's Corner, helped to groom Duncan the pony and took a walk through the nature trail. What a busy but fun day! We made delicious rhubarb crumble using the rhurbarb grown in our garden. We have been taking part in the school version of the Big Garden Birdwatch. We spent time in the wildlife area and the garden using the bird hide to see which birds we could spot. We are getting very good at recognising the different birds. We made binoculars, bird feeders and bird cake and took some bird cake home to put in our gardens. We have been celebrating Chinese New Year with lots of creative activities. We tasted some delicious noodles and did some chinese writing. Look at our colourful display! 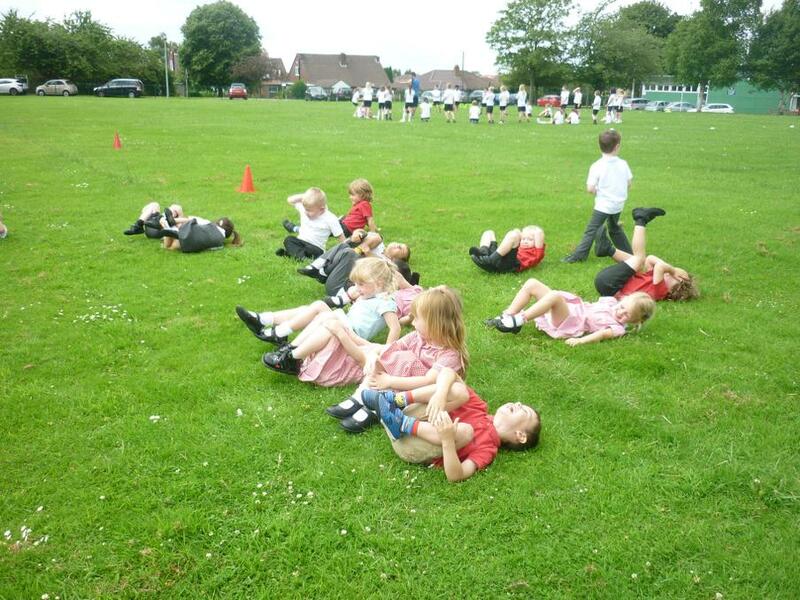 It has been a very busy first term in the nursery. 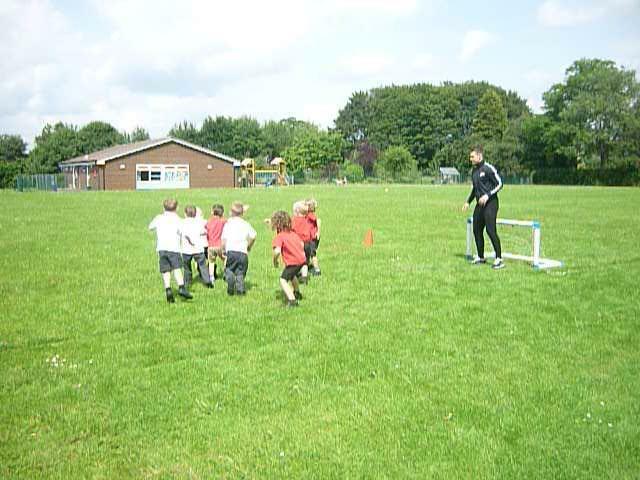 Our first topic 'All About Me' helped children to settle into their new class...finding out about the different areas of the classroom, getting to know everyone, trying new things and having lots of fun! The children really enjoyed the story 'Where's My Teddy?' by Jez Alborough. This led to lots of different activities and to finish we had a 'Teddy Bear Day' when we invited our favourite teddies in from home. Our Christmas trip to the Sale Waterside Theatre to see Charlie and Lola's Extremely New Play was a great success. We all had a brilliant time! Thank you to all of the parent helpers. Parents, thank you for all of your support over the first term. Please continue to fill in 'Wow Moments' to tell us about your child's recent achievements and the great things they are doing at home. The following link provides information on the phase of the phonics programme we follow in the nursery (Phase 1), with ideas and resources. It also shows how this progresses into reception using Phase 2 upwards.